Home / Blog / How do cold draughts get into the home? How do cold draughts get into the home? Who knows what the winter will bring? More beasts from the east / pests from the west? Or mildness and Christmas daffodils? The weather is so unpredictable but there’s one thing that’s for sure: the days will get shorter and the nights will get longer, and with that the number of hours of natural warming will be reduced, resulting in the need to heat the home. 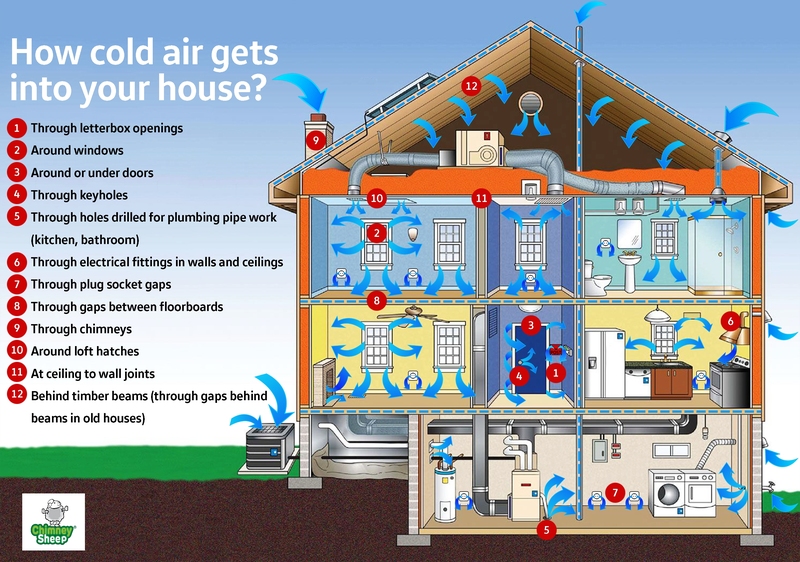 As heating costs rise, it makes sense to look around the home and see what can be done to keep warm air in and cold air out. Where do cold draughts come from? At Chimney Sheep, we have an ever-increasing range of products to help keep your home cosy. Well, if you’re here to get a Chimney Sheep, we may as well make it easy for you to draught-bust your home and offer a few other things while you’re here! Once you’ve got your Chimney Sheep fitted, how about fitting a letterbox cover? This is super easy to fit as Frankie from Cumbria Action for Sustainability demonstrates here. What about the base of the door, do you need a draught excluder there? We’ve got floor cushion types filled with off-cuts of Herdwick wool that give it a good hefty weight and holds itself in place. The high quality covers are removable so they can be dry-cleaned. Or we’ve got draft exclusion brushes that fit along the bottom of the door. The loft lids are very popular, for fitting over the back of down-lights so that insulation can be laid over them in lofts. And remember your outside tap – we’ve got neat insulated outside tap covers that simply fit over the tap and help prevent pipes from freezing. Just remember when you are draught-busting that some vents are meant to be there to get the right amount of oxygen to your appliances that need air for combustion. If they don’t get enough oxygen they will produce carbon monoxide which is deadly. So please don’t block vents that are there for your safety! While draughty chimneys can be obvious ways in for cold air, some of the others can be frustratingly difficult to pinpoint. You can feel the cold draught but its source is elusive: then you need a Smoke Pencil! This nifty gadget emits a plume of smoke-like vapour that is actually quite harmless and created by passing glycerine + fluid over a heating element. It sends out a controllable plume of smoke at the press of a trigger to hunt out the more elusive sources of cold air. It’s also got multiple applications for the creatively minded as a Halloween accessory….